A small, durable green laser sight light combo specially designed to fit subcompact pistols but also works well with various compact and full size handguns. 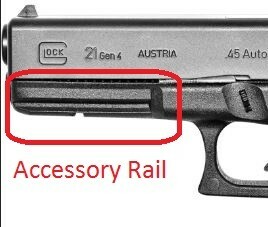 See fitting guide below for specific handgun brands and models. Dimension: L x W x H = 1.5in.x 1.6in x1.8in. This green laser light combo requires an accessory rail. Quickly and accurately responded to my pre-purchase inquiry whether it would fit my Beretta PX4 Storm Compact (fits perfectly); shipping was reasonably prompt considering the Thanksgiving holiday; I personally prefer Fedex or UPS to USPS; otherwise I am completely satisfied with this product. Installation was fast and simple. Item seems to be well made. Features are great. Included extra battery and battery charger (USB and/or household current). My intent was to put this unit on my PK380. It fit just fine, but the physical size of the laser didn't balance the size of the pistol. I had an EAA Witness in 40 SW with a full size frame and a rail. The size match was good and the switch position was perfect. Took it to the range the next day and in full sunlight I could pickup the laser dot on a poor contrast target at 10 yards. First shots were within an inch at 10 yards, and a simple adjustment brought the laser dot and POI together.